like most sallet helms, possessing a rounded crown and a slightly-swept back to protect the neck. Unlike the common depiction of a sallet, though, this helmet does not feature a visor, instead leaving the warrior's face open to make breathing and seeing easier. 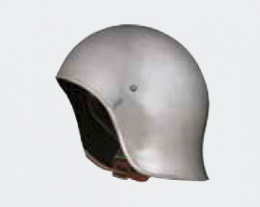 The helmet is made from quality steel. Later Italian sallets (by c. 1460) lost their integral face protection and became open-faced helmets with gracefully curved surfaces. In this simple state they were favoured by lighter-armed troops, especially archers and crossbowmen, whose uninterrupted vision was at a premium. This page was last modified on 2 May 2014, at 18:13.